Lumens Integration has a new document camera that helps teachers project their experiments onto a big screen where the whole class can see them. No more crowding around the goldfish bowl. 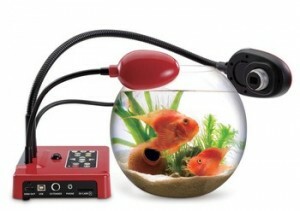 Students can see the fish swimming on a large-screen TV or movie screen. Alex Wulff, a fifth-grade teacher in Ventura, California uses a Lumens camera to project a kind of lizard on the big screen. “I can grab the bearded dragon and put it on the screen and suddenly every single kid is glued to whatever I’m saying.” He likes to switch back and forth between the live animal, pictures of other animals from the Internet, and worksheets. A math teacher in Arlington, Virginia uses it to model math games with three-dimensional cubes, pattern blocks and coins, which she was unable to do with a conventional overhead projector. You still need a projector to work with the camera, so it gets pricey. ($790 at markertek.com.) Why not just use an ordinary video camera and a projector? You might not be able to get a good angle, the way you can with the bendable gooseneck on the Lumens camera, and you might not be able to achieve the same quality of lighting.